An end of season reflection: Support to save Dennison Flats! Hi guys. Fantastic to see the Press Release regarding plans to limit access to the Eucumbene around Dennison flats. A much-needed outcome: accolades to all of the stakeholders that met and agreed on what is the only way forward. The last day of the season was relatively quiet. Sunny skies and clear water conditions required a lot of persistence to locate fish, let alone catch one! A mate and I still enjoyed ourselves of course – as there is always a new challenge or unexpected condition to adapt to (or at least try to!). After wrapping up in the early afternoon, we decided to have a quick look around the upper crossing. Unfortunately we avoid that area these days because of the carpark and the crowds. Motorhomes, tent cities, campfires, stubbies, plastic water bottles, nests of tangled 20lb fishing line…we’ve seen it all. Anyway, before we were within eyesight of the crossing, we heard the collective roar of diesel and petrol engines. Was there some kind of major recovery underway? As we walked over the rise, two vehicles completed their last couple of donuts. Chunks of sod, mud…sub-alpine grassland, were flying everywhere. The area adjacent to the crossing was literally being shredded. The vehicles soon re-grouped with a few others before tearing off over the hill with more unnecessary wheel-spinning. A nearby angler had seen everything. The group had become bored and had been challenging each other to see who could complete the most laps of the area in 2WD without getting bogged. Two vehicles had even been strapped together by the bull-bars to play tug-of-war. Here’s a couple of pics the area after they departed. Unfortunately the existing access equates to access for every level of mentality. Whilst the vast majority of like-minded angler folk value the beautiful river and the National Park – and the browns! – and rainbows - there an unfortunate minority who do not, and will trash everything without a fleeting thought. Until now I’ve certainly appreciated being able to access the river area with my own 4WD. Like most like-minded anglers, I’ve done so with due care and respect. I fully acknowledge however, that given the increasing volume of traffic, it would be far better for the river and our wonderful sport, if we were to walk instead. Not only will it preserve the delicate environment, but it will spare our precious fishery from that unfortunate minority who aren’t real anglers at all, because they will drop their clutch and rip up everything in their path if the fishing isn’t easy enough for them! 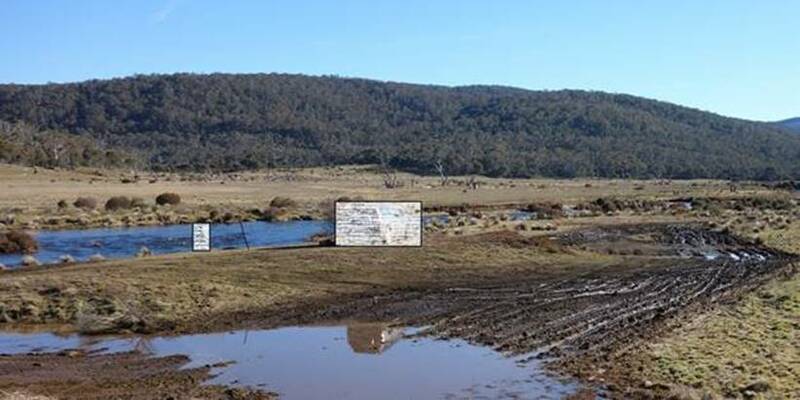 Access must be restricted by establishing a car park back toward the campground. Let’s all walk – for the fishery and our sport. Thanks for selling me those olive green and brown bead head woolly buggers. 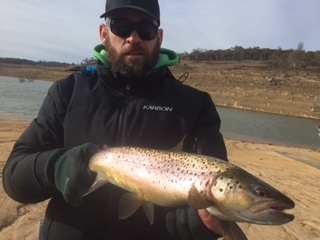 Finally caught my third trout on fly (and first fly fishing trout in Jindabyne). Hardly a monster but very happy nonetheless. 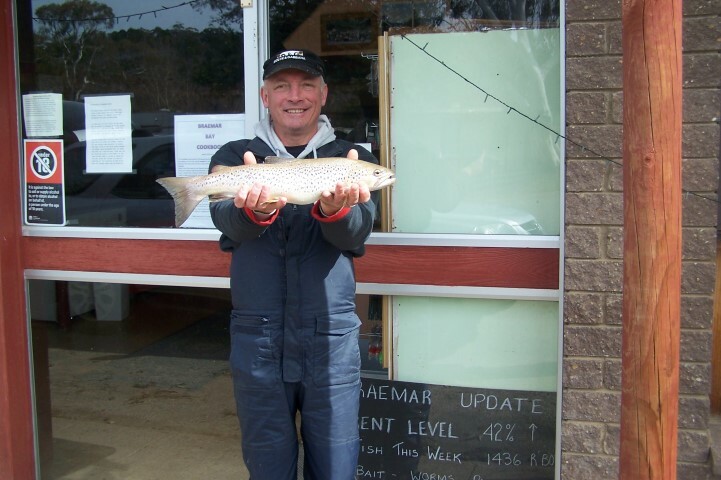 Peter at Braemar here with a fishing report for the week. Stable weather and fine conditions greeted most late week anglers after early week wind and rain, the Lake has risen nicely over the past 3 weeks and it seems it has encourage a few fish to get out and about, some very nice Browns and Rainbows have been cruising the edges in search of a quick feed, anglers casting bank based lures such as Pegron, Toby’s and flashy metal lures have brought some good results, although some reports coming in suggest that the fish are still a bit tentative and will readily chase a lure but not actually attack it, that will all change over the next couple of weeks as their aggression levels increase with a quest for food. Sergey from Sydney once again had a successful few days landing 5 fish using a combination of power bait and worms, his best fish was brown a bit over the Kilo mark with some nice Rainbows also encountered, Daryl Suckley had a successful morning landing a Rainbow within 2 minutes of setting up his gear and the Harrington boys caught a lovely 48cm Brown on a Cherry Blood near the Dam wall in roughish conditions. From mid August to late October the fish will be most active after their spawn duties, generally at Braemar the bank based fishing will be best from now until late September with land based lure fishing also being the best bet until late October, the trolling will improve as the water warms up a bit and some clarity returns, there will be very successful days mixed up amongst some ordinary days for the trolling brigade, my advice is to come prepared for all forms of angling which should bring some results, the fly-fishing will be very hit and miss until there is some consistent warmth in the air, one thing is for sure though, it can be a very exciting time of year for all anglers. Pictured below is Sergey with his nice Brown caught on power bait and Peter Harrington with his 48cm Brown.